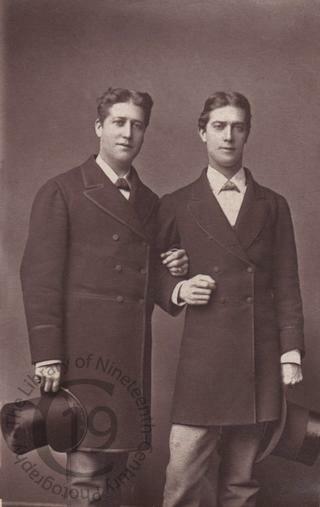 The brothers were two of the three sons of William Wardroper, a surgeon who at the time of Walter’s birth in 1847 was living at 45 Welbeck Street in Marylebone. Walter Hillyard Wardroper was baptised at St Marylebone Church on 7 March 1847. In 1851 the family were living in Nottingham. On 4 December 1873, at St Bride’s in Liverpool, Walter married Emily Holway, daughter of William John Holway, a builder. Walter gave ‘Artist’ as his profession on his marriage certificate. The couple appear on the 1881 census living at 28 Grove End Road, St John’s Wood, with their three children. Walter now gave ‘Comedian’ as his profession. By 1891 they had four children and were living in Willesden. This time Walter gave ‘Actor’ as his profession. According to a website devoted to the history of pubs of the area, from 1892 to 1896 he was the landlord of the Malsters’ Arms in Broadwater near Worthing, West Sussex. By the time of the 1901 census he was once again an ‘Actor,’ living with his family in Worthing. He died there in 1908, aged 57, and was buried in Broadwater Cemetery. His older brother Henry was born Henry Sheehan Wardroper on 21 February 1845, also in Marylebone. At the time of the 1871 census he was living at Leek in Staffordshire with his mother Louisa and brother Walter. He gave ‘Author’ as his profession. On 6 January 1874 at St Bride’s in Liverpool he married Edith Light, daughter of William Light of Bristol. Henry again described himself as an ‘Author.’ In 1881 he and Edith were lodging in Willesden. He now described himself as an ‘Artist Dramatic.’ By 1891 he had abandoned Edith, who was lodging in Hampstead, and was living maritalement in Wimbledon with an Australian singer, Caroline Collden (née Baumgardt), and her two daughters, both born in Sweden. Henry was still working as an ‘Actor.’ By 1901 he and Caroline had gone their separate ways and Henry was living in Yarmouth, working as an ‘Artist (Painter).’ The only other member of the household was Florence Roslin, a ‘housekeeper’ twenty years his junior. Henry died in Canterbury in 1910, aged 66. The photograph was given away as a free supplement with the Saturday Programme on 19 February 1876.